The human brain is remarkable. In comparison to other animals, the brain is seven times bigger than it should be for the size of the body. During evolution, it enlarged in a rather short amount of time allowing humans to surpass other primates. Researchers now have insight into the human advantage and ways to optimize the brain. We will explore these findings as well as the intricate functions of the nervous system. The human advantage is not due to the size of the brain; it is the fact that humans have more neurons that carry and process information in a relatively small cerebral cortex (outer surface of the brain) than any other animal. Thanks to the invention of cooking, humans were able to ingest a greater number of calories and nutrients in a short time. This lead to the rise in the human’s ability to reason, discover patterns, develop technology, and expand language. The brain has approximately 86 billion neurons and is part of a complex, sophisticated system. The nervous system controls and coordinates all bodily functions and activities—every heartbeat, breath, movement, and thought. For many years it was believed that nerve cells in the adult brain, once damaged or dead, did not replace themselves. Researchers, however, have found that neurogenesis, the growth and development of new neurons, is found in adults in several areas of the brain. There are two broad categories of cells within the nervous system: neurons and glia. Neurons are known as the working units that process information and carry electrochemical impulses, which are electric and chemical messages. The chemical messages are known as neurotransmitters (e.g., serotonin, dopamine, and glutamate). Glial cells provide metabolic and mechanical support to the neurons as well as produce myelin (definition below). The neuronal cell structure, or soma, includes a nucleus, cytoplasm, and cytoplasmic organelles. The nucleus contains deoxyribonucleic acid (DNA) and data that is necessary for growth, metabolism, and repair. Cytoplasm, also called protoplasm, is the colorless substance that fills the cell, which includes all the chemicals and parts necessary for the cell to function. The cytoplasmic organelles are known as “little organs” in the cytoplasm; each type of organelle has a specific role. The cell membrane surrounds each neuron and separates the contents of the cell from its surrounding environment. It controls what enters and leaves the cell and responds to signals from the environment. Dendrites are the short, branched segments on the receiving end of the nerve cell. The axon is the threadlike part of the nerve cell that extends from the cell body to meet and deliver impulses to another nerve cell. The length of an axon can range from a fraction of an inch to several feet. 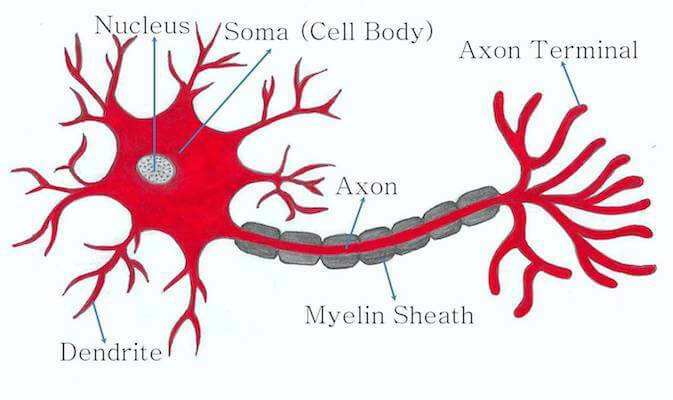 Myelin is a fatty white sheath that surrounds the axon and some nerve cells. It forms an electrically insulating layer that is essential for the quick transmission of impulses along nerve cells. Synapses are tiny gaps between neurons where chemical and electrical signals move from one neuron to another. Inside the Brain of a Neuron – a review of several studies to enhance the understanding of information processing in single-neurons arithmetic. Myelin and Nerve Structure – an illustration of the myelin sheath of a neuron. Glial Cells of the Peripheral Nervous System: Satellite Cell and Schwann Cell – a look into the glial cells of the peripheral nervous system. Regulation and Function of Adult Neurogenesis: From Genes to Cognition – a look into the relationship of neurogenesis and cognitive deficits in the adult human. Adult Neurogenesis in Humans: Common and Unique Traits in Mammals – a review of data on the extent and dynamics of neurogenesis in adult humans and other mammals. Brain-Derived Neurotrophic Factor (BDNF) and Its Clinical Implications – an explanation of the role BDNF plays in neuronal growth and survival. Action Potential for Kids – a description of resting membrane potential (neuron at rest) and action potential (neuron sending information down an axon). Neuroscience for Kids – a review of how to classify neurons based on the number of extensions that extend from the soma. The organs of the central nervous system include the brain and the spinal cord. Although recognized as two separate organs, the brain and spinal cord are continuous at the foramen magnum, which is a hole at the base of the skull forming the passage through which the spinal cord exits the cranial vault. Because they are vital to human survival, they are encased in bone for protection. The brain sits in the cranial vault (the space within the skull), and the spinal cord is located in the vertebral column within the vertebral canal (spinal canal). In addition to bone, meninges, or connective tissue, and cerebrospinal fluid surround and protect the membranes of the CNS. 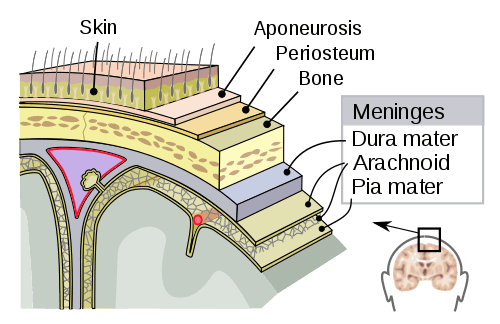 The three layers of meninges include the dura mater (outer), arachnoid (middle), and pia mater (innermost). Neurons need oxygen, glucose, and stimulation to function optimally. For example, if you have ever gone too long without eating, you may have felt sluggish from low blood glucose levels. The neurons in the brain have a high energy demand and consume approximately 5.6 mg of glucose per 100 g of human brain tissue per minute—approximately 25% of the body’s energy budget. The brain divides into left and right cerebral hemispheres, which are joined by and communicated through the corpus callosum (figure 4). In neuroscience, the cerebrum and cerebral cortex are practically, but not precisely, the same thing. The cerebrum is the entire top part of the brain including the white matter, which is mainly myelinated axons. The cerebral cortex technically refers to the highly wrinkled outer surface, or the gray matter, which contains numerous cell bodies and few myelinated axons. The brain consists of three basic units: forebrain, midbrain, and hindbrain. Figure 5 illustrates each unit in a developing embryo. 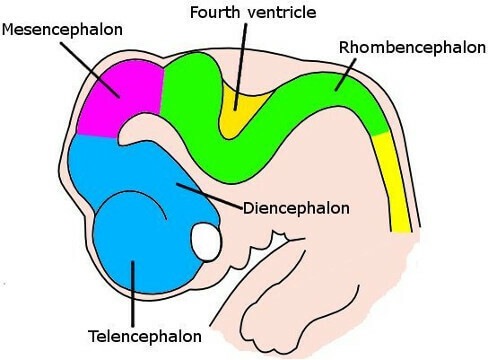 The forebrain, also called prosencephalon, separates into the telencephalon and diencephalon, which are interconnected with the limbic system. The midbrain, or mesencephalon, is a section of the brainstem that forms the primary link between the forebrain and the hindbrain. It controls motor and visual functions, auditory responses, and sleep/wake arousal. It is made up of the tectum, tegmentum, cerebral aqueduct, and cerebral peduncles. 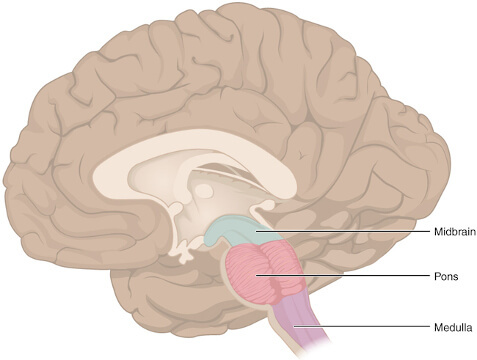 The hindbrain, or rhombencephalon, occupies the posterior region of the brain and is a part of the brainstem. 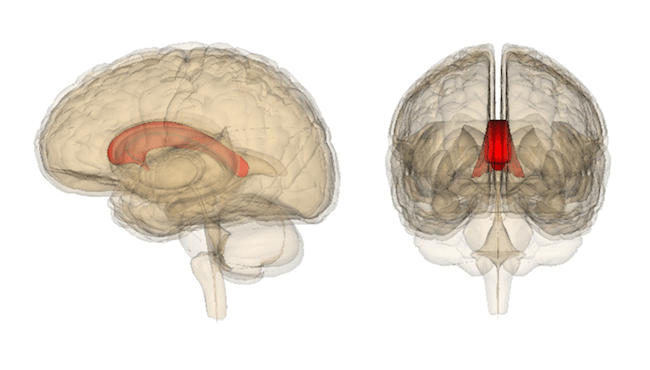 The hindbrain consists of the myelencephalon and metencephalon. 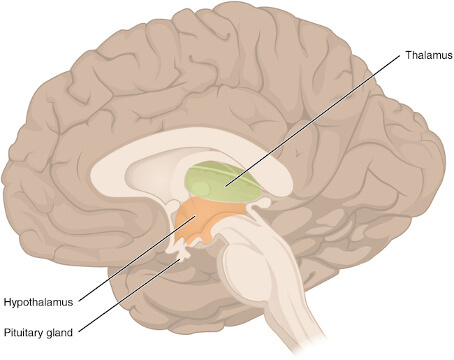 The metencephalon portion of the hindbrain includes the cerebellum (Latin for “little brain”), pons, and reticular formation (located throughout the brainstem and cerebral cortex). The pons and the cerebellum are responsible for the control of movement, balance, and transmitting sensory information. The reticular formation is responsible for sleep and consciousness. 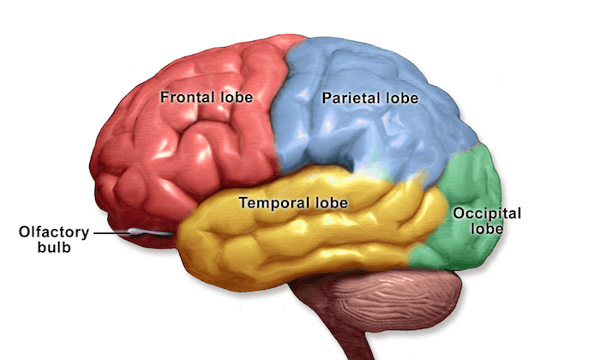 The myelencephalon is also called the medulla oblongata, or the medulla. It deals with the vital autonomic functions of the body, such as digestion, respiration, and heart rate. Meditation may influence the medulla and the immune system. Twelve pairs of cranial nerves emerge directly from the brain; 10 of the 12 originate from the brainstem, and two nerves arise from the cerebrum. 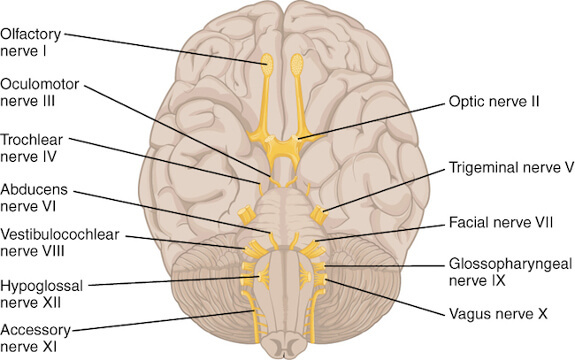 All of these nerves, except for the vagus nerve, pass through the foramina of the skull. A very small 13th cranial nerve, known as the terminal nerve, was identified more than a century ago; however, more research is needed to determine its role in humans. Downward from the medulla oblongata is the spinal cord, a long white tube that is made up of nervous tissue and support cells. The spinal cord divides into 31 segments with each giving rise to a pair of spinal nerves (peripheral nerves). Carrying information – The spinal cord sends signals to and from the brain. Coordinating reflexes – The spinal cord can coordinate reflexes on its own, which makes it responsible for quick, coordinated responses to stimuli. The thermal grill illusion is an excellent example this. It is an experiment that elicits an ice-like burning feeling—without causing harm—by using warm and cool metal bars. When a person places their hand on the metal bars, the pain signals quickly tell the spinal cord to react without knowing what it’s reacting to. Controlling reflexes – The spinal cord controls reflex responses that are typically involuntary. These reactions are sudden and are an automatic response. The peripheral nervous system (PNS) consists of the nerves and ganglia. Nerves are bundles of nerve fibers, similar to how muscles are bundles of muscle fibers. Ganglia are clusters of nerves cells. The spinal and cranial nerves extend from the CNS to peripheral organs. The basic constituents of the neural circuits within the PNS include afferent (sensory) neurons, efferent (motor) neurons, and interneurons (relay) neurons. 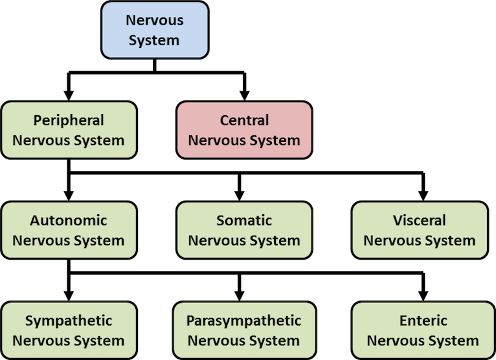 The PNS further subdivides into the somatic nervous system, autonomic nervous system, and the visceral nervous system. Further discussion will focus on the somatic and autonomic divisions of the peripheral nervous system. 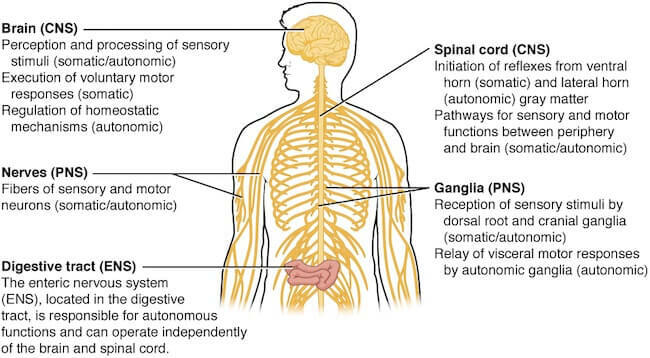 The somatic nervous system (SoNS), also called the voluntary nervous system, permits conscious control of the skeletal muscles and consists of both afferent nerves and efferent nerves. The SoNS includes spinal nerves, cranial nerves, and association nerves. The autonomic nervous system (ANS), or involuntary nervous system, supplies motor impulses to the cardiac muscle, smooth muscle, and to the glandular epithelium (one or more cells that can produce and secrete a particular product). The ANS is only in connection with the efferent side of the nervous system. The ANS further subdivides into the sympathetic, parasympathetic, and enteric nervous systems. 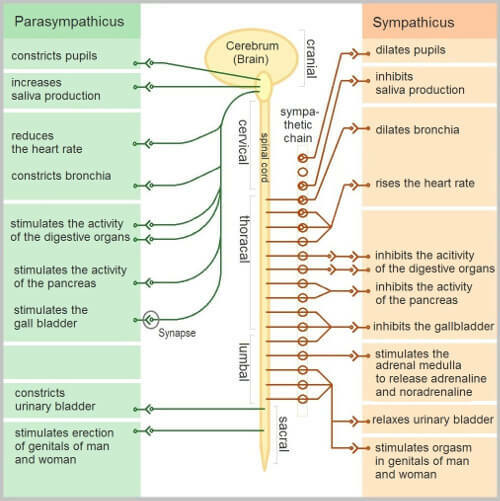 The sympathetic and parasympathetic branches interact to maintain cardiovascular activity within an optimal range and permit reactions to changes in internal and external conditions. The sympathetic nervous system initiates the “fight-or-flight” mechanism when it detects danger or a threat. 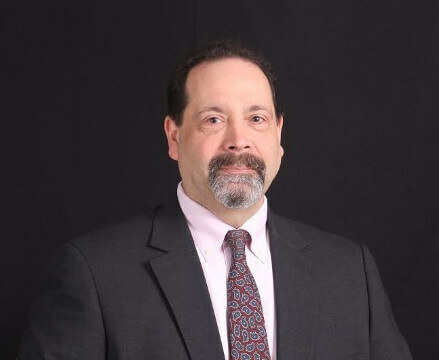 This threat may include internal stressors (e.g., chronic stress or anxiety) or external stressors (e.g., physical injury or environmental pollutant). A redirection of energy takes place when the sympathetic nervous system is activated; digestion is put on hold, the heart rate and breathing rate escalate, pupils dilate, and there is an increase in the production of saliva and sweat. When the parasympathetic nervous system takes over, the opposite effect occurs; digestion restarts and breathing and pupils return to normal. The enteric nervous system, also known as the intrinsic nervous system, is a separate nervous system for the gastrointestinal system, which to a great extent, autonomously controls bowel motility. The gut-brain axis (GBA) consists of a bidirectional connection between the enteric and central nervous systems. The GBA links cognitive and emotional centers of the brain with peripheral intestinal functions. Recent advances in research describe the importance of the gut microbiota in influencing these interactions. The brain gives clues about its state of health. The following are the most common key indicators of a nervous system disorder; however, each person may experience symptoms differently. If not quickly and appropriately treated, a disease or illness that involves the nervous system may have severe consequences. As you review the list below you will find that many disorders fit into several categories. By following the guidelines below, people can help keep their nervous system healthy. Always speak to a healthcare practitioner before starting any new exercise, regime, or diet. Exercise regularly—get your heart rate up to increase BDNF. Refrain from caffeine six hours before bedtime. Take care of conditions that may cause a decrease in the function of the nervous system, such as low or high blood pressure and diabetes. Eat a balanced diet that consists of whole food with ample sources of flavonoids, omega-3 fatty acids, B6, B12, and folate. Get plenty of sunshine and have your vitamin D checked. Ask your doctor if nootropics are right for you. Perform intermittent fasting or caloric restriction. 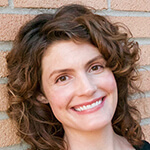 Improve your gut-brain axis and intestinal motility: video tutorial. Talk to your doctor about a low-carbohydrate diet for mood disorders or an autoimmune diet. Drink plenty of water—the heart and brain are composed of approximately 73% water. Do not smoke or use tobacco products. Do not use illegal drugs such as meth, cocaine , heroin, or other non-prescribed drugs (such as non-prescribed opioids). Learn new skills to rewire the brain. Concentrate on one thing at a time—the brain is not the best multitasker. Wear head protection when performing a risky activity, which may include riding a bike, skateboarding, football, etc. Prevent falls in the home—remove rugs, keep walkways clear, clean up clutter, and use a nightlight. Please contact us at support@pacificmedicaltraining.com to reach the author or recommend other ailments or brain-health tips that interest you.